In Leviticus, Yahweh/Yahuah/God speaks to Moses (Mosheh) and commands Aaron (Aharon) and his sons, the Levitical priests, to make offerings for of the people, with each offering having its own specific instructions on how to prepare the offering and how to prepare the altar. We know that every step to every command that Yah gives is important and has meaning. One of the verses that really begins to give light (pun intended!) to the portion for the week is from chapter six, “Fire is continually kept burning on the altar, it is not put out.” In this week’s reading, we will see how this continuous fire physically and literally gives a recurring theme of sacrifice, love and obedience . It’s believed that the Israelites would put a copper pot over the coals of the altar fire as they moved their encampment from place to place. The copper pot would allow the coals to continue to smolder, keeping the fire burning. 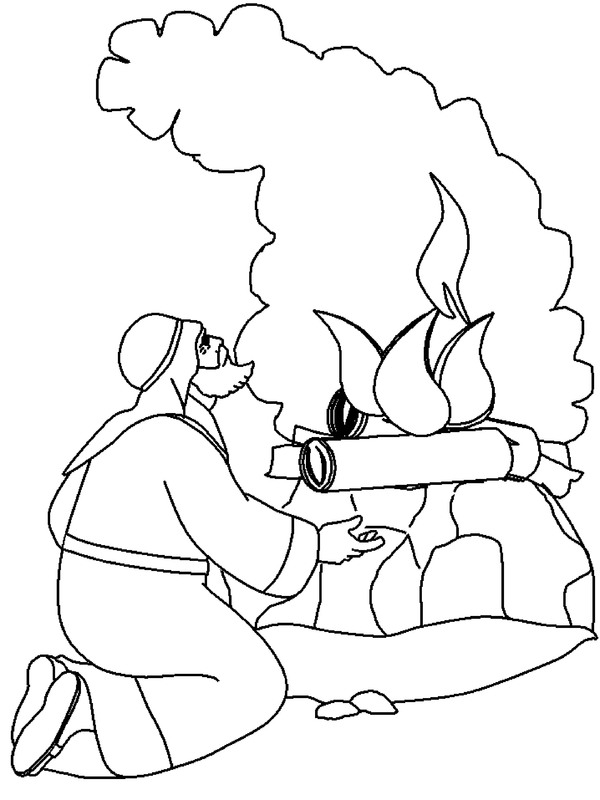 Once they would get the tabernacle set up, we can envision one of the priests doing what we would do to our campfire upon waking in the morning. They would start the process that Yah commanded to begin sacrificing and they would stoke it in order to get a roaring fire going for the day. There were five types of offerings described in Leviticus: Burnt, Grain, Peace, Purification, Reparation. The system of sacrifice was designed to bring them back into closeness with the Father after they had sinned and repented. It was a method of worship but we see clearly how this method is not the true delight of Yah. He takes no pleasure in sacrifice (Heb. 10:6), it means they (we) had sinned against Him! He desires obedience producing holiness and righteousness. In the reading from Isaiah we see they are reprimanded because they are bringing their abominations – their futile offerings – to the Lord (Isa 38:13-18). “Wash yourselves, make yourselves clean; put away the evil of your doings from before My eyes. Stop doing evil!” It’s important to study, and “reason together” and know that God never intended for sacrifices to make them righteous. Sacrifices were meant to bring them closer to God after they had repented. When there was no repentance and they remain stiff-necked and stubborn, their sacrifices meant nothing. Let’s look at the rest of the weekly portion and see how it all ties together beautifully in this picture of sacrifice, love and obedience. We see in Ruth, the “sacrifice” Boaz makes to redeem Ruth and become her husband and give her children. We also see in contrast, the unwillingness of the other family member to do it because he didn’t want to ruin his own inheritance. Next, we see Hannah, in 1 Samuel, making an oath to Yahweh that she would give her son to Him if He would open her womb and bless her with child. And she does! As soon as her sweet baby boy is weaned, she goes up and gives her offering and her son to the Father for His service. Then in John, Yeshua (Jesus), knowing what his sacrifice will mean for him, without hesitation he tells to the Pharisees and the soldiers that He is the “I Am”. He is the King of the Natsareth. We also see Peter (Kepha) by the fire, a worldly fire, forsaking the Eternal fire by denying the Messiah for the third time. Lastly, in 1 John, the very clear definition of what it looks like to LOVE & OBEY. We keep his commands and we guard them. That through sacrifice of the Son of Elohim, we have understanding and eternal life. Through the three that bear witness in 1 John 5:8, the Spirit, the water, and the blood, we see a reflection of the process of sacrificing of the priests in Lev 8:23 applying blood to the ear, the hand, and the foot. There’s nothing new under the sun! The Father has always had an end-game in mind. He never intended for the sacrifices to make someone perfect. Only our perfect Redeemer can do that. In Hebrews 10 it is confirmed that Yah never sought true delight in sacrifices. It is our own personal responsibility to draw near to the Father and keep our fire burning for His Word, His Truth and HIS Light. We are His delight! Our focus should always be on stoking the fire to keep it burning in our hearts and to draw near to him by sacrificing ourselves daily in submission, repentance, and obedience to His commands and to His Son. We cannot just be hearers of the word but doers, like James says, so that our hearts and minds are constantly fixed on Him and his justice, his kindness and his equity. Our desire to learn His commands and grow in His truth, to test everything, to reason together, is proof of the fire within us. Sometimes the fire on the altar of your heart may be a bonfire, beautifully raging hot in the dark night. And sometimes we may just have a small kindling of coals, low and steady. Whatever and wherever the Father has you, don’t let your fire burn out. Do not forsake what is good. Repent, keep your oath, obey the Father and love one another. Be sure to join us again next week, Week 26 in the Weekly Scripture Reading.